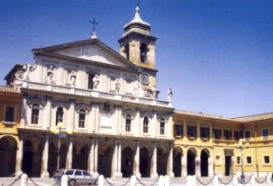 From the main road two streets are leading almost directly to the square of the Terni Cathedral: one remembers the name of Lodovico Aminale from Terni, "the courageous soldier who, at the tournament of Barletta added his sling of laurels to the Italian glories"; the other, named Via dell'Arringo, remembers how on the square one wanted to put together the popular assemblies to decide during peace and war times upon all the needs of the free City of Terni. And here we are, approaching the church, from which it is quite difficult to determine the time of the first building, even if during the last restorations made on the pavement of the portico "berniniano" came to light the remains of an apse dating back to the VIth century with numerous burials. Inside the church, under the choir, is located a construction attributed to St. Pellegrino, first bishop of the city. Over this oratory are located also the ruins of the consecration to thundering Jupiter. The bishop St. Anastasio founded the major temple dedicating it to Maria Assunta in the sky, but the restorations and the reductions realized specially by the Cardinal Rapaccioli in 1653 have almost completely cancelled the traces of the antique monument. Under the external portico berniniano are present three entrances to the temple. The central one is decorated by a rich frieze comprised among sumptuous "modanature", in which are alternating themselves various animals and roses sculpted in the XIth century. Both minor doors, drawn with a severe simplicity, are attributed to roman art; on our right there was a fourth door with acute arch dating back to the XIVth century, sculpted with the elegance and style of the time. The richest part of the arch ornaments is on the part corresponding to the front of the lateral pillars, where is represented a vine shoot coming out on the left of a vase and hold on the right by a farmer. Inside, of the antique vestiges only the tabernacle of the saint oils remains under the choir of the 1600. At the center of the apse, shining of precious marbles, is dressed the tabernacle built by Carlo Murena, containing the reliquary called "of the very precious blood". In the posterior part a beautiful choir realized at the middle of the 500. Of particular interest the organ dating back to the 1600 with annexed cantor probably restored under the order of the Cardinal Rapaccioli. In the sacristy are preserved a reliquary having the form of a cross, jewelry work in silver plates and engraving of the XIVth century.